Pickup a New Stressless City Low-Back with High Base Chair- Enjoy an Authorized Low Price. The Low Back City Chair is one of the many popular models offered by one of our favorite Norwegian Recliner Brands. The firm, tight stitching allows for a strong support of the lower back and hips. The straight, vertical seaming of the comfort zones allows for parallel support of each side of the major back muscles. This chair is an exemplary demonstration of Ekornes' Comfort Expertise. Choosing Unwind is the best way to save time and money when ordering this chair. Ask about our in-stock selection for the quickest shipping options. Have Questions or are you ready to order? Drop us a chat (click the chat button at the top of the page) or a line at 888-486-9463 or 1-601-932-5111 (Internationally). View our Blog to learn about what’s new and exciting in detail or drop our Ekornes Brand Specialists a line at 888-486-9463. We can explain the specifics of each product and help direct you to money-saving opportunities. On most Stressless Recliner models, you can choose a matching accessory. These include: the useful Ellipse Table and the stylish Urban Table. It is an excellent time of year to purchase from the well-padded, soft, comfortable Stressless City lineup! This super-comfortable series guarantees unsurpassed head, neck and back support and the perfectly soft cushioning allows you to sit undeterred for many hours on end. The City Low Back Chairs are simplistic in design. They are comfortable, Ekornes quality, and Chiropractor approved. The Low Back variety come at a lower price and without an ottoman. This makes them ideal for card or dinner tables and gatherings. It also is convenient for spaces in dens and living areas that would be overcrowded with a big ottoman. It's a perfect time of year to purchase from the new, polished steel, Stressless City lineup! This newly introduced chair and ottoman series insures proper head, neck and back support and includes many comfort features that add to the appeal of the new modern styling. The Stressless City recliners allow you to sit without strain or sore muscles for many hours on end. These new beauties have been among the fastest-growing, newly launched Stressless recliners at Unwind. The Popular Stressless City Low-Back Recliner is a medium-size Stressless recliner. 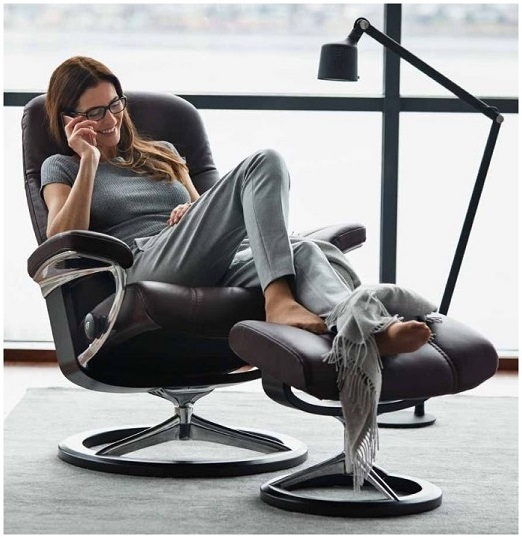 Like its sibling (the Stressless Metro Recliner) the Stressless City Low-Back Recliner has been called "perfectly comfortable in all the right places". We translate this to mean- "Just the right amount of support and comfort to the parts of the body that desperately seek a refuge from the toils of everyday life." -Stressless Recliners are created for a custom fit- Many of the Stressless recliners come in three sizes (small, medium or large) and many sofas are available in two sizes (medium or large). The Stressless City Recliner (small) is comparable to the small versions of the other Stressless recliner lines. For best results, take a seat and let us help you determine which size will ultimately offer the most comfort and correct support for your individual body size and weight. For additional information, check out the Product Sheet below! It's no surprise that Stressless City Recliners are Exclusively Endorsed by the American Chiropractic Association (the ACA). Come visit the Unwind Back & Body Store to experience the Ekornes Stressless City for yourself. If you have already decided and are ready to order, please click the chat button at the top of the page or call (888) 486-9463 to speak with one of our Customer Service team members. We will ship your City recliner fully-assembled and ready to enjoy. Please review our return policy prior to ordering or call 888-486-9463 (or 1-601-932-5111) for personal assistance. You may also email stressless@unwind.com anytime- 24 hours a day- 7 days a week.